Unless you're a subscriber to Blacklock's Reporter you probably didn't see this story, but last week Canada's Standing Senate Committee on Agriculture and Forestry met to discuss market access to Canada's agricultural and forestry products. Invited to this particular chat were representatives from Dairy Farmers of Canada including their President Wally Smith, and their Executive Director Caroline Émond. 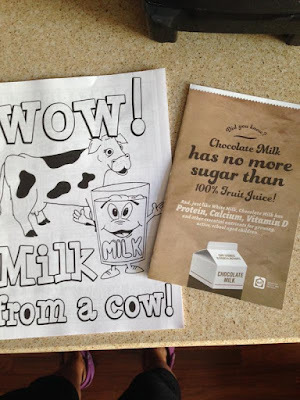 "I came across some remarkable statements about the amount of sugar and the fact that the sugar in chocolate milk is not an issue and we shouldn't be concerned about that. It shocked me, quite frankly, because sugar is a serious contributor to the obesity problem that we have in Canada and around the world. Just to take a quick example, a 250 millilitre glass — that's one quarter of a litre, for those of you who want to follow this — of chocolate milk, 1 per cent, has 160 calories and contains 25 grams of sugar. A glass of Coca Cola of about the same size is 100 calories and 26 grams of sugar. Now I understand there are other things in the glass of chocolate milk, but the idea that you can state unequivocally in here that there should be no concern whatsoever about the sugar in chocolate milk astounds me. It would take an ordinary person in ordinary exercise approximately an hour and a half to work off that many calories. It would take a vigorous workout to do it in half an hour. The issue is not just the amount of calories; it is in fact the amount of sugar. They are empty calories, they are high calories and they contribute negatively to health overall. I was startled to see that. I happen to like chocolate milk, by the way. I had never seen a statement such as that and I'd like your reaction." "You have spoken to obfuscate the issue, and I congratulate you on that. 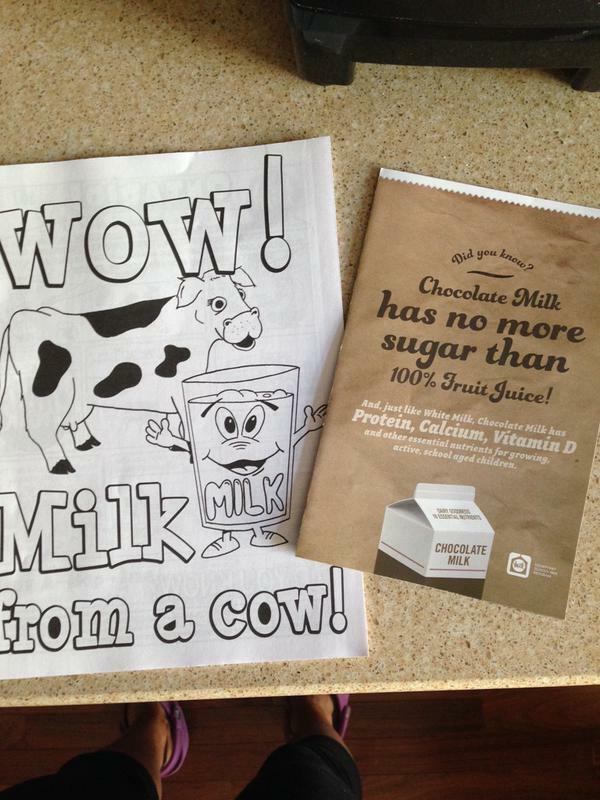 In the basic white milk, there is far less sugar, so you actually have significant added sugar in here, and it is the added sugars, absolutely, that are the very serious issue." 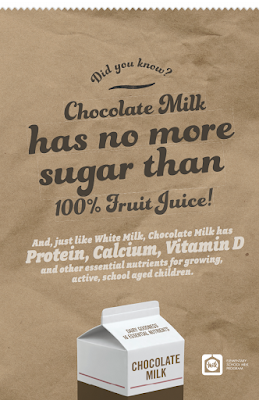 "We position chocolate milk as a sport recovery beverage. It's a great positioning and it works well with athletes and sporting people who are using chocolate milk as a recovery beverage instead of energy drinks, which are, again, empty calories. We try to position the product in the best possible light. I understand your concern." I wonder how Ms. Émond and Dairy Farmers of Canada would explain all the photos on this page? 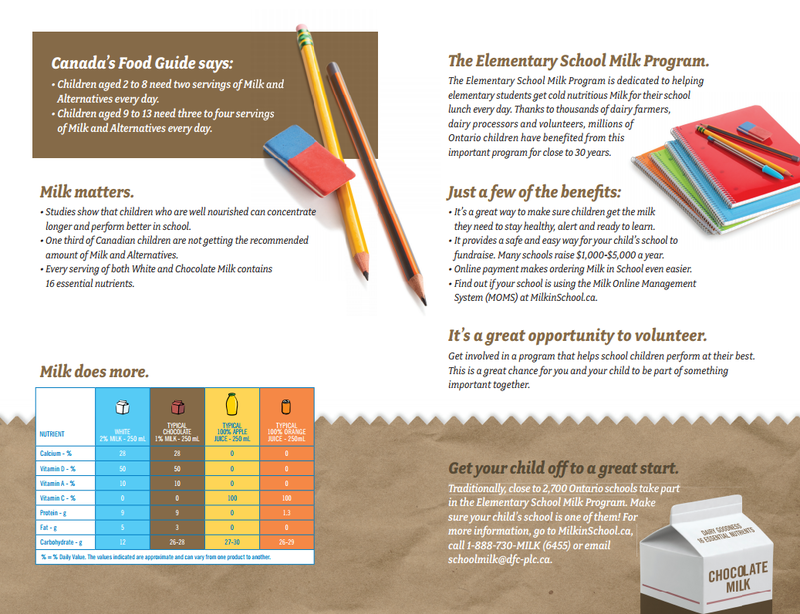 You see they're all photos of the marketing materials that Dairy Farmers of Canada recently distributed to elementary school children and their parents as part of their Elementary School Milk Program. And front and centre in those materials that are marketed to Canada's youngest school children and their parents are the very claims that shocked Senator Ogilvie. 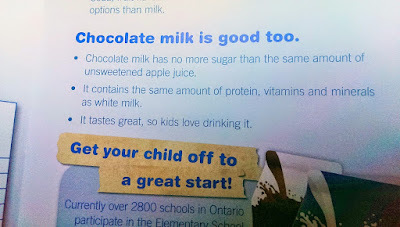 And not only are the claims front and centre, but the brochure itself is clearly designed to position chocolate milk preferentially over white milk with 3 of the 4 pages of the brochure literally being brown (with only the back of the brochure promoting white milk), and the line, "Get your child off to a great start" framing a carton of the chocolate stuff. 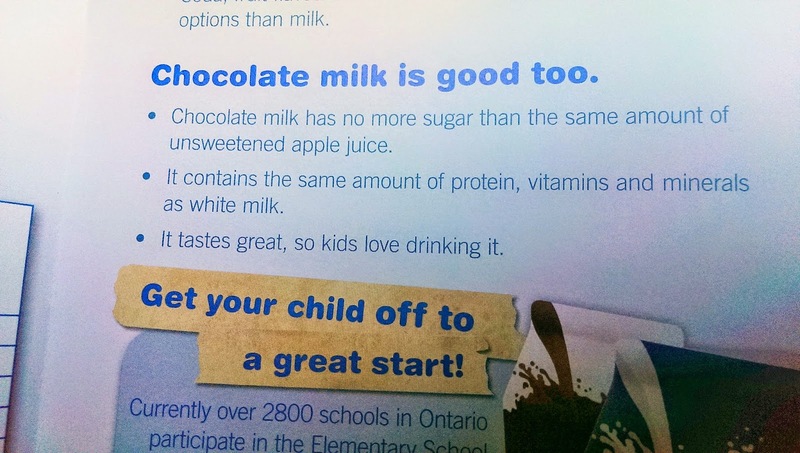 There's no denying that Dairy Farmers of Canada are doing their best to position chocolate milk as a recovery beverage to athletes, but there's also no denying that they're positioning it to children and their parents as health food. A positioning echoed by the brochure sent home with children last year. Kindergarteners and elementary school children aren't athletes. 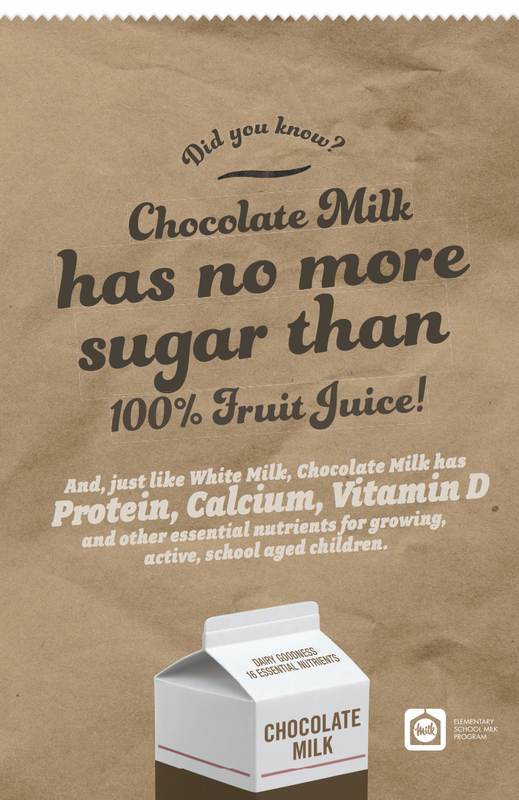 Chocolate milk isn't health food. And Dairy Farmers of Canada, if their statement to the Senate was meant to suggest that they don't market chocolate milk to anyone other than athletes, are plainly lying.